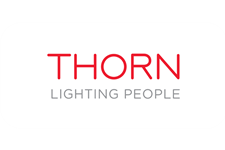 Thorn Lighting company, founded in 1928 by Sir Julius Thorn, is part of the group Zumtobel. Today Thorn Lighting company is one of the leading manufacturers of reliable equipment for indoor and outdoor lighting and lighting control systems. Thorn Lighting is producing innovative products for different customers, from wholesalers until the public and private organizations and individuals. Their products are used for lighting offices, cultural facilities, interiors and exteriors of shopping malls, roads, landscapes, sports facilities, industrial facilities in more than 100 countries.